It’s easy to get caught up in the excitement of creation as we’re building our latest widget. By the same token, it’s sometimes difficult to fully appreciate just how old some of the circuits we use are. Even the simplest of projects might make use of elements that were once a mess on some physicist’s or engineer’s lab bench, with components screwed to literal breadboards and power supplied by banks of wet-cell batteries. One such circuit turns 100 years old in June, which is surprising because it literally is the building block of every computer. It’s the flip-flop, and while its inventors likely couldn’t have imagined what they were starting, their innovation became the basic storage system for the ones and zeros of the digital age. The second decade of the 20th century was a time of rapid innovation in electronics, brought about by the development of vacuum tube technology and the subsequent commercialization of radio. Where many of the earlier experiments in radio were the sole province of scientists trying to understand the mysteries of nature, this was a time of innovation to address practical needs. If the world was going to have radio, someone was going to have to invent it. Enter the team of William Eccles and F.W. Jordan. British physicists who both came of age with radio, Eccles and Jordan both contributed mightily to the field. 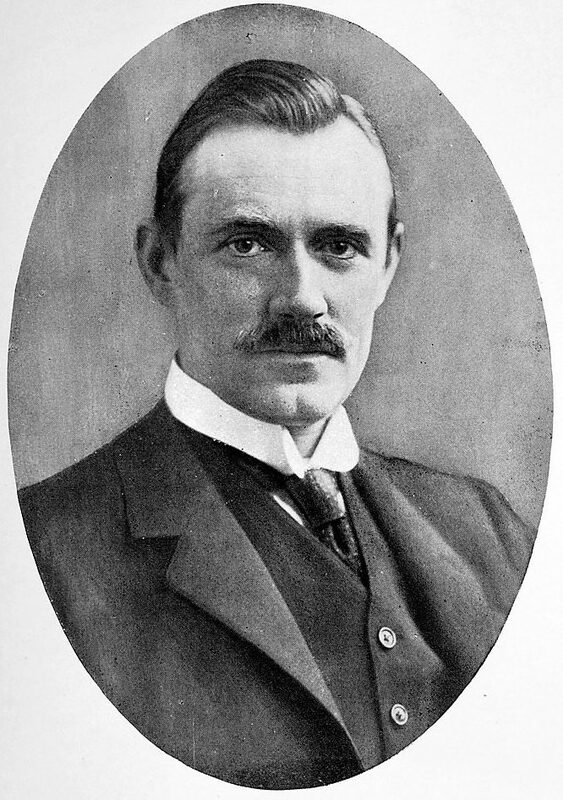 Eccles was one of Guglielmo Marconi’s assistants and an early proponent of the then-untested theories of Oliver Heaviside that a layer of charged particles in the Earth’s atmosphere made long-distance radio communication possible. Eccles was the first to propose that the sun was responsible for the diurnal variations in propagation that had already been observed. After the Great War, Eccles and Jordan collaborated on multiple projects, one of which led to what they called a “trigger relay.” While their original papers show that they recognized the utility of a circuit with two stable states, and even proposed uses for it, such as a latching relay that could be controlled by radio, it’s not exactly clear that they set out to invent what would become known as a bistable multivibrator. It is clear that they based their circuit on the previously published multivibrator circuit of French physicists Henri Abraham and Eugène Bloch. Composed of two triodes with their control grids capacitively cross-connected, the circuit produced square waves rather than the sine waves of most oscillators at the time. The resulting harmonics-rich signals were useful for calibrating radio equipment. Eccles and Jordan realized that the astable multivibrator could be made to hold two discrete states if the grids of the triodes were resistively, instead of capacitively, cross-coupled. With the capacitors gone, the triodes are put into an unstable equilibrium that soon collapses into a stable state where one of the triodes conducts. 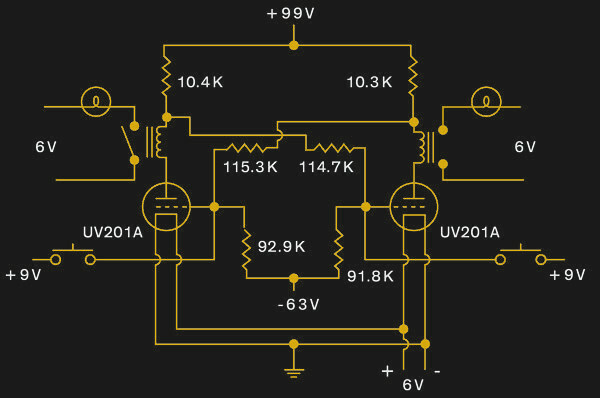 The state of the circuit remains stable until it is perturbed by a control signal that causes the first triode to switch off and the second to conduct. The Eccles-Jordan circuit had been born. The Eccles-Jordan trigger remained largely unused for the next 20 years or so. It eventually attracted the attention of scientists at Bletchley Park who were designing Colossus, the computers used to help break the Lorenz ciphers used by the Germans. After the war, Eccles-Jordan triggers, still using vacuum tubes, found their way into computers such as ENIAC and even into early electronic calculators. The second half of the 20th century saw the basic principles of the Eccles-Jordan trigger modified and updated dramatically. Transistors replaced the triodes, various flavors (JK-, SR-, D-, and T-types) were developed, and everything was miniaturized onto integrated circuits. But no matter how small the circuit, the same basic topology of cross-connected inverting amplifiers is still at the heart of it all. In honor of the 100th birthday of the flip-flop, [Richard Brewster] undertook a period-correct working replica of the Eccles-Jordan trigger, seen in the featured images for this article. Some concessions had to be made, of course — century-old audion tubes are hard to come by, after all, and the original wet-cell batteries and decade resistance boxes Eccles and Jordan likely used are too bulky and impractical these days. But he did manage to score recent updates of the UV201 triode that would have been available in 1920; expensive though they were, the UX201A tubes lend a period look to the breadboard circuit. He also used vintage glass-tube resistors from old radios, emptied of their original carbon elements and refilled with modern composition resistors. Antique telegraph relays serve to switch the loads. It’s a good-looking build and a suitable tribute to the staying power of the Eccles-Jordan circuit. Google should have a doodle to commemorate the day. IAgree type not declared. Integer presumed. Wraps infinitely (passing through negative agreement) on overflow. Relay 2 (unlabeled but implied) in the schematic is missing its armature. I was expecting this to be about bistable footwear! That’s Hawaiiana-a-Day, our sister website. Before their use in Colossus, vacuum tube flip flops were found in many first generation radar sets, used in the lobe switching circuits. No comments yet about “should’ve used a 555”? Use an Arduino and LEDs. Should’ve used a Raspberry Pi. Only problem is that the Raspberry Pi’s 300 MHZ “GigaBit Ethernet” is way too limiting. The text and the picture add correctly. But it is a beautiful (re-)build. Dude, it’s not talking about storage or even RAM. Think CPU registers, program counters, state registers, etc. There are tons of these used in every CPU, GPU, most chips in fact. Yes even the 555 has one. And precisely what do “…modern memories…” store? You should have a reostat in series with the filaments, UV201A are 5 volt tubes. Change the value as the A battery discharges. It looks really good, except for the 9V batteries that look so out of place on the otherwise very vintage looking project. I’d have put them in a separate wood box, with a Bakelite-looking lid, with brass posts. Beautifully done other than that. What is an “unstable equilibrium”? Is it like “Military Intelligence” or “Microsoft Works”? I almost flipped when I heard that there was going to be a 100th anniversary celebration, but it turned out to be a flop!